Sorry for the late post today. Trivia last night! Hopefully this post will make up for it. 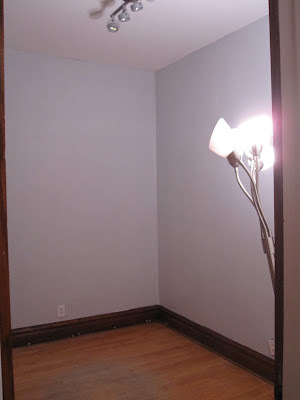 As for wall color... I want dark. Everyone keeps raving about black walls, navy walls, chocolate brown walls, maroon walls. I am, as we all know, a light and neutral kinda gal and one of the least trendy people to walk this planet. But I figured, what the hell - what's one wall? This wall will be my baby step. 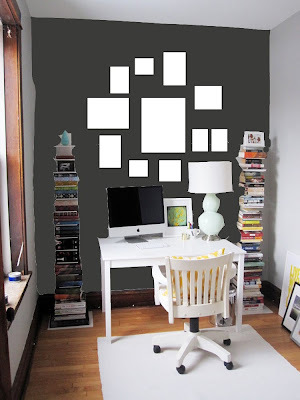 Here are a few work spaces that put the dark wall into practice. Loving this jet black with the vibrant books adding pops of color. You had sold me on the gray so I'm a little weary for the darker colors but then again, you've made everything else look so good. Definitely go for the dark wall! Woohoo! I am interested in following your progress bec. 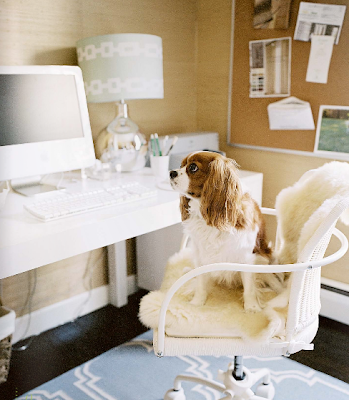 I have a somewhat similar plan for my office. I will hopefully post some things I've pulled together on my blog later this week. I am def. 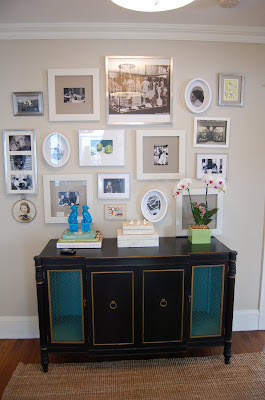 going for the wall collage but the haphazard thing is a little tricky for me. . .looking forward to seeing yours. PS--I am definitely for the dark wall! You will love it. I am thinking a dark gray for mine. Looks great so far! I can't wait to see the final product! i think you should also do those GOREGOUS black and white vertical striped curtains! how dramatic! love your plans for the office! can't wait to see the final product! Love this post. 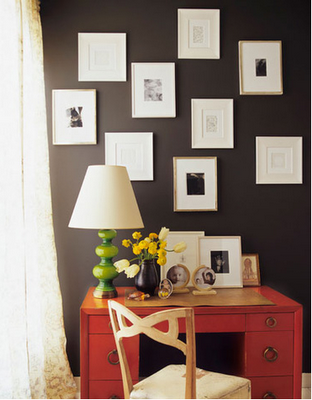 I am loving a black wall, think it will look so sharp with the frames. Can't wait to see the finished product! I like your plan. Can't wait to see how it turns out! Definitely go for the dark wall. 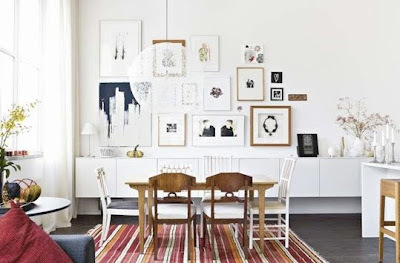 On the poster wall don't go all floor to ceiling and possibly frame it with an art frame. May be several long, oblong, etc. I saw this done at "Michael's" craft store and it didn't look like a typical bulletin board. The lady before said window treatment -- maybe white blinds and the cording in in a dark color and/or vise versa. Is the book stand from West Elm? Love what you've done so far. I have a small gallery style hanging over my desk right now and I'm really into it. 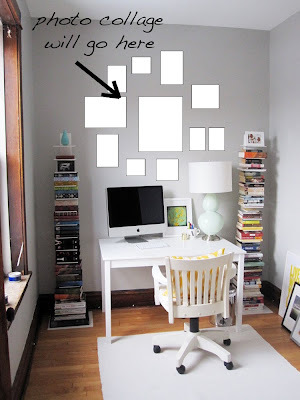 I wish I had an office to decorate though...and could paint! It really does look gorgeous. I can't wait to see it all finished up! And I LOVE that lamp! 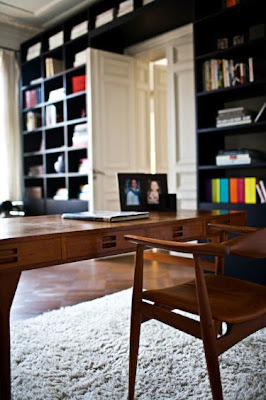 Your office is going to look AMAZING- I am jealous...haha! Found your blog through Deliciously Organized, randomly. It's great- you have a new follower! PS: I have a giveaway on my blog... check it out! I think this looks like a great plan. You might like looking at my wall of pictures (they're all lithographs or drawings with a few silhouettes), but I have loved it. Here's the link http://townandcountrymom.blogspot.com/2009/12/boughs-of-holly.html --it's a Christmas decoration post, but you can scroll through the decorations fairly quickly. My wall has a traditional feel, but I have loved the darker wall color, which is a dark gray that goes kind of olive at night. Good luck with your office; I can't wait to see the "after." Really like your plans for the room! Can't wait to see how it turns out! 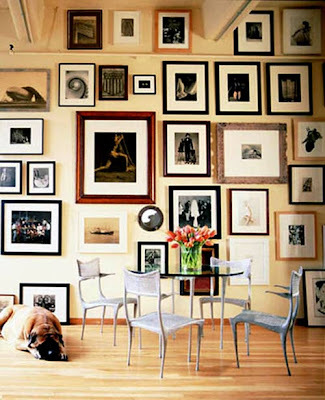 A gallery wall will look fantastic there, plus I can really see a dark wall looking fabulous. Excited to see how it turns out! Alaina, I really love your ideas! My bestie from college is an interior designer and she always makes sure her rooms are "done." Unfortunately I am too ADD to stay with decorating for very long. 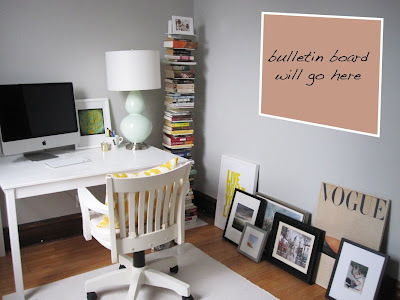 You've inspired me to try again on my office! I love what you have done with it and what you plan on doing to it! Can't wait to see the finished pictures. think it's so modern and chic. 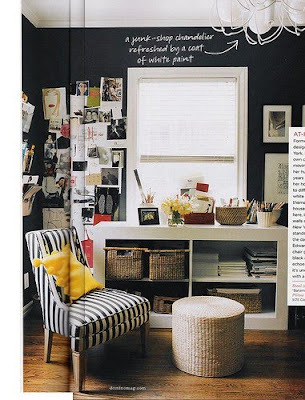 now you need a cool black and white rug to go beneath your desk! where is your desk from? I love it!